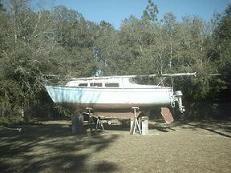 So, it's not a chrysler and won't help me get the 26 back to the water, but check it out. Actually, Sylvia went with me to look at it and said she would have bought it even if I wasn't with her. Top that. She calls it her back porch. You will get no grief from me - redhead and I have been cruising about looking for the same thing. Almost bought a 30' Chris Craft, but it got away from us..also a Carver 3395..with her back and knee and resulting mobility problems it just works better for her in cruiserland..a C26 I can singlehand and will always enjoy, but she wouldn't mind having a 'back porch' for us together.. Vary nice, I have been looking at boats all winter. 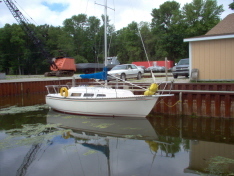 With water levels getting lower in the Great Lakes an slips with deep water hard to find there are a lot of boats for sail. Wonder what your new boat will look like after you get the Mast an Sails on it? Be sure to take Photos an post them. I foresee more water time in your future! Party Dog - the redhead is looking at a "back porch" this weekend. If its a keeper its going to cost me having to quickly sale (instead of sail) my C26 on the coast for her slip space..and costs. Which will then leave me and you with the wife's "back porch" boat afloat and a C26 in the yard..
My wife would have much preferred I was a power boater on this scale or larger as well. Seems that heeling over stuff just is not he cup of tea. That's is a very nice looking boat to be sure. Too bad your not closer or I'd have to beg a ride. Her name is Rag Doll, and she is a 1969 (same age as me) Chris Craft Commander. She was re-powered in 2000 with twin 6.2 liter AM General Diesels (marinized humvee motors) and then the port diesel was replaced in 2005. She is well equipped with 4 fuel tanks (220 gallons total, aprox 660 nautical mile range), a phasor 3.5kw diesel generator (unknown condition, I haven't started it or looked closely at it yet), ray marine auto pilot/gps/depth, vhf radio, electric stove top, microwave oven, pressure water (no water heater, yet), electric anchor windless, dual steering stations (fly bridge with engine controls and cockpit without engine controls), gas grill, salt water wash down pump, am/fm/cd radio, a 3 bank battery charger, swim platform with a super beefy ladder (scuba anyone? ), and a bimini top with full curtained enclosure for the fly bridge. She sleeps 6, two in the vberth, 2 when the dining table is lowered, and two on the starboard settee. The settee is cool, the back cushion has a hard base, and it flips up. There are straps that hook to the ceiling to make bunk beds (it's a clever design that might translate well on a Chrysler 26). I replaced the starboard raw water pump, and all the raw water hoses for both engines. I replaced the port battery cables and discovered a broken wire on the starter that was shorting to the starter housing causing the battery cables to melt. I replaced the port transmission cooler, and flushed out the port transmission. I replaced a few fittings for the bimini. We had a diver clean the hull and replace all the zincs (ouch, $495 just for that, we won't use him again). We refilled the hydraulic fluid for the steering. So far, the grand total including purchase price and repairs: $4200. This is my first real power boat, and here are a few things that I've noticed. Power boats have way more zincs than sailboats. Driving a twin engine boat with only one functioning engine is more exciting than you would think, especially when docking. The wind has way more of an effect on a power boat than you would think. Driving from the fly bridge is cool, but takes some getting used to (you can see down into the water from up there, so maybe I won't run aground as often). You don't have to think twice about most bridges. 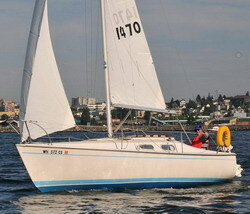 You don't have to try to remember what position the keel is in. Power boaters don't worry much about electricity, there are lights everywhere on this boat (6 just in the main cabin). 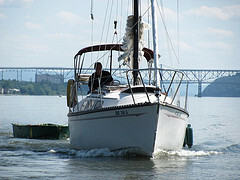 Alanhod wrote: My wife would have much preferred I was a power boater on this scale or larger as well. Seems that heeling over stuff just is not her cup of tea. Nice boat. 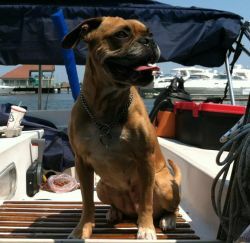 One of her sisters lives down the dock from Copacetic. Having diesels should be a big plus in the long run.